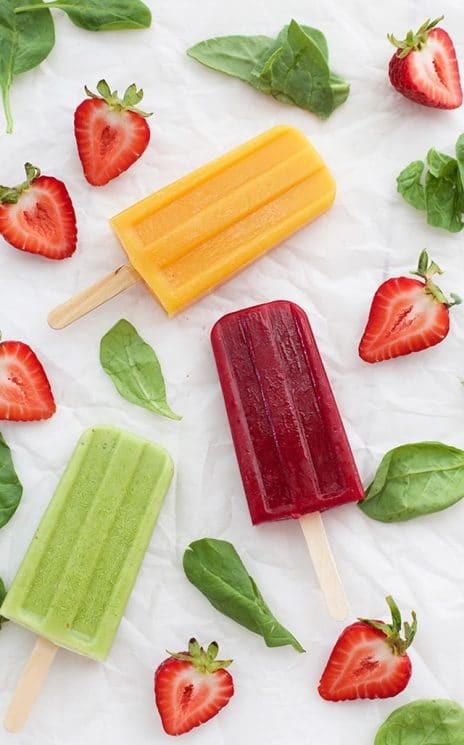 3 Healthy Fruit and Veggie Popsicles for healthy summer snacking. They’re colorful, delicious, and your whole family will love them! I live in perhaps the hottest state in the United States. From April to October we live in 90-100 degree temperatures, sometimes getting up as high as the 120’s. It’s hot! Still, we love to make the most of wherever it is that we live. And that, my friends, means lots and lots of popsicles. 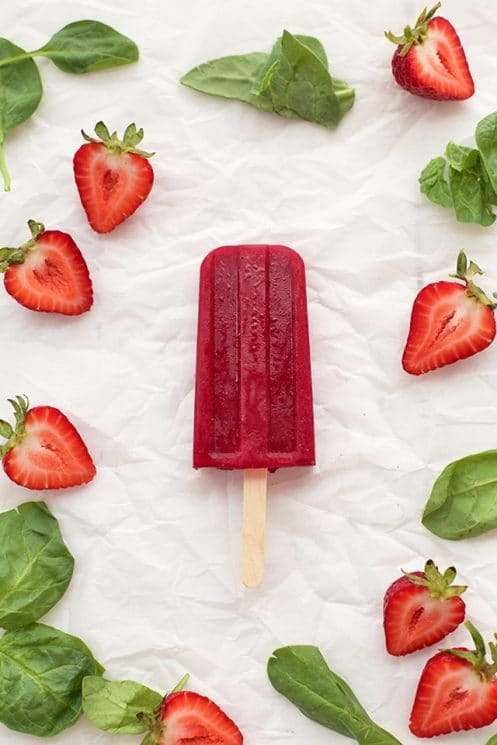 These gorgeous ice pops get their color from the combination of strawberries and beets. The strawberry flavor is definitely what you’ll taste most, though this is a great way to introduce your kids to beets. Look for frozen beets or refrigerated cooked beets for even simpler prep! In a blender (preferably a high-speed blender), puree all ingredients until completely smooth. Pour into your favorite popsicle mold and freeze 3-4 hours, or until completely firm. Makes 5-6 popsicles. These are one of our all-time favorites. You can make your own carrot juice or purchase 100% carrot juice at nearly any grocery store. We freeze leftover carrot juice in ice cube trays and pull out a cube or two any time we’re making smoothies. It lends a gorgeous color and some natural sweetness we can’t get enough of. Puree all ingredients in a blender until completely smooth. Pour into your favorite popsicle mold and freeze 3-4 hours, or until completely firm. Makes 5-6 popsicles. 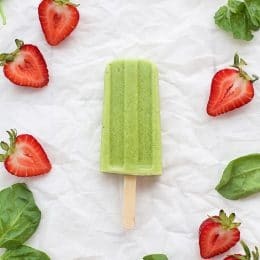 If you’re working on adding greens to your child’s diet and they’ve been resistant, I’ve found that smoothies and smoothie popsicles like this one are GREAT for starting out. Many kids who wouldn’t touch spinach on their plate will happily enjoy it when it’s used to color a lime popsicle. 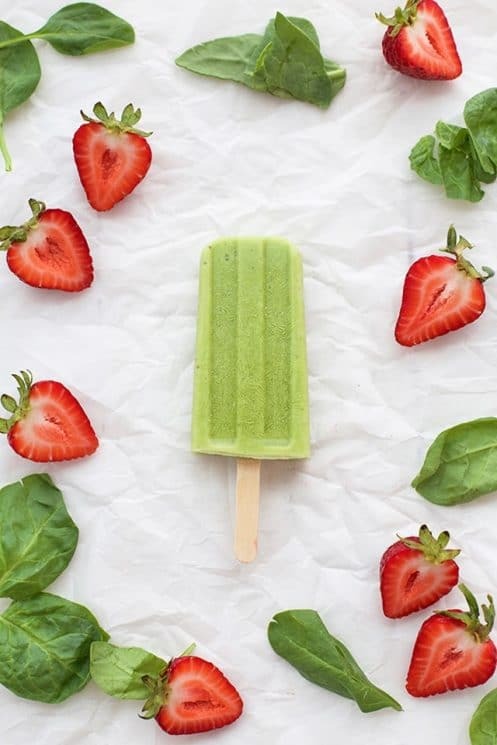 Everyone expects a lime popsicle to be green, right? Puree all ingredients in a blender until completely smooth. Pour into your favorite popsicle mold and freeze 3-4 hours, or until completely solid. Makes 5-6 popsicles. Popsicle Molds. We talked all about our favorite popsicle molds here. The number of popsicles you’ll get out of each recipe will vary based on which popsicle mold you use. Don’t have or want a popsicle mold? You can use small paper cups. Freeze the popsicles for about 45 minutes to 1 hour, then poke in the popsicle sticks and continue to freeze until solid. 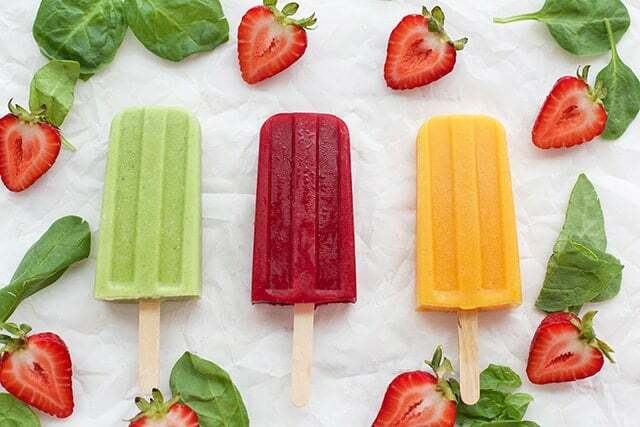 Emily Dixon eats a LOT of popsicles while blogging at One Lovely Life, where she shares healthy recipes and happy thoughts for whole living. Zest and juice lime; chop pineapple. Puree all ingredients in a high-powered blender until completely smooth. 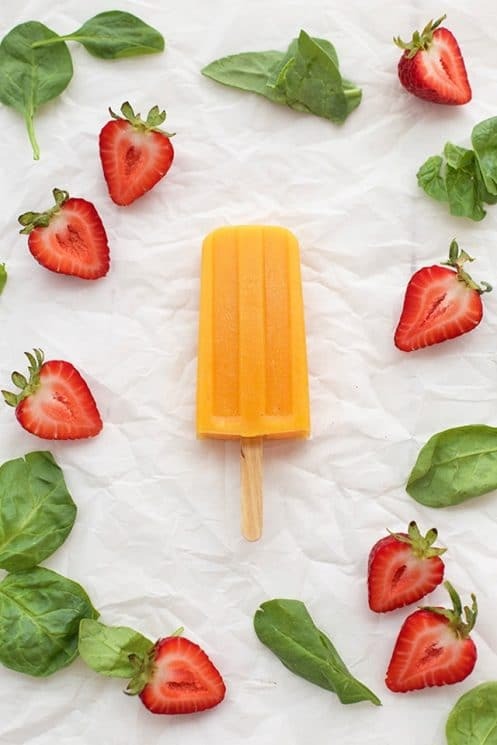 Pour into your favorite popsicle mold and freeze 3-4 hours or until completely solid. Delicious! My 2 yo loved them. Delicious and I love that spinach is the color and lime and is flavor! Parenting Win. This is a very great idea. I love Popsicle. These are taste, cool looking and good for you! Thanks for sharing. Tasty and healthy. My kids would never eat these ingredients individually, but they loved these popsicles! This one got smiles from all around the table—grownups, too! I didn’t think it would be limey enough, but the lime and pineapple are a good combination to make it flavorful instead of tart. I love how refreshing and healthy these are and all the kids gobbled them up!